Every once in a while at classically educated, we take a few minutes to think about stuff. It generally isn’t our first choice of activities, but we can be bludgeoned into it. 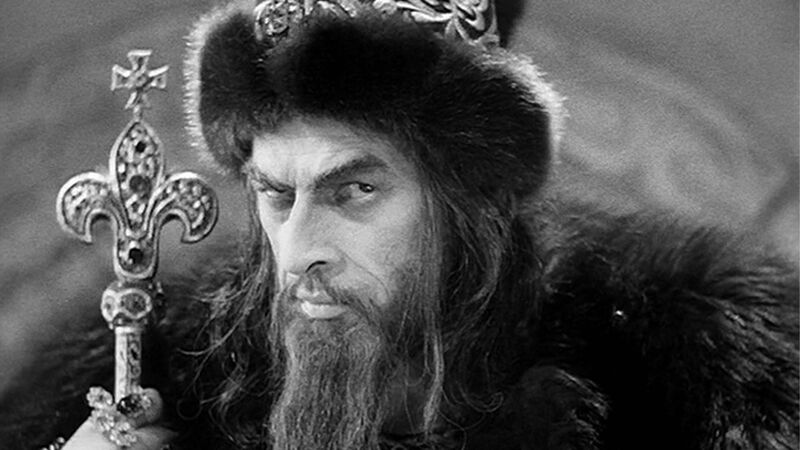 One such episode happened when viewing one of Eisenstein’s classic films from the 1001 movies list: Ivan the Terrible. The film itself is a two-part, four-hour monster, but it passes reasonably quickly despite that. It has war, murder, betrayal, intrigue and all the good things that a movie needs in order to be a good piece of entertainment (talk about living in interesting times), and the Ivan the Terrible character reminded us a LOT of Johnny Depp as Jack Sparrow. It is a historical film packed with a heck of a lot of actual history. And history, if you happen to be viewing five hundred years later as opposed to being in the middle of it, is quite diverting. So the movie went past quickly, with a “highly recommended” verdict on the side. 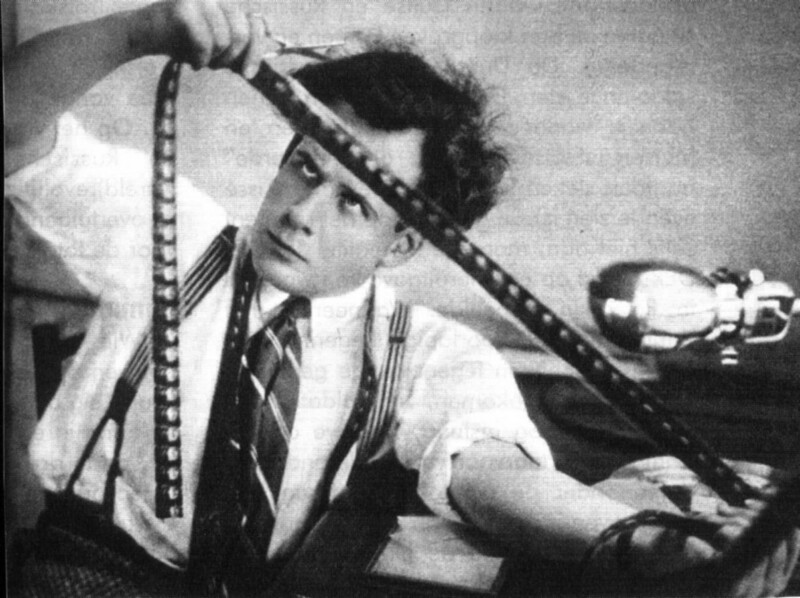 You’d be hard-pressed to find CE giving Eisenstein that kind of a rating normally as his masterpieces, Battleship Potemkin and October, though innovative and respected are terrible as entertainment – propaganda films generally are. But this one deserves the descriptor “eminently watchable”. However, it’s what’s behind the film that makes one think. To me, Eisenstein’s life epitomizes life of Soviet citizens. Being essentially himself, he was constantly in and out of favor as the political fads changes in the party. His films were critical successes until they were criticized because they weren’t popular enough (a crime that, in the communist paradise, could entail an appointment with a firing squad). The first part of Ivan the terrible won him a Stalin Prize, the second was suppressed until after Stalin’s death and garnered its creator a severe reprimand. He was allowed to go on tour in the west for a brief period – but then had to face the distrust of his peers. 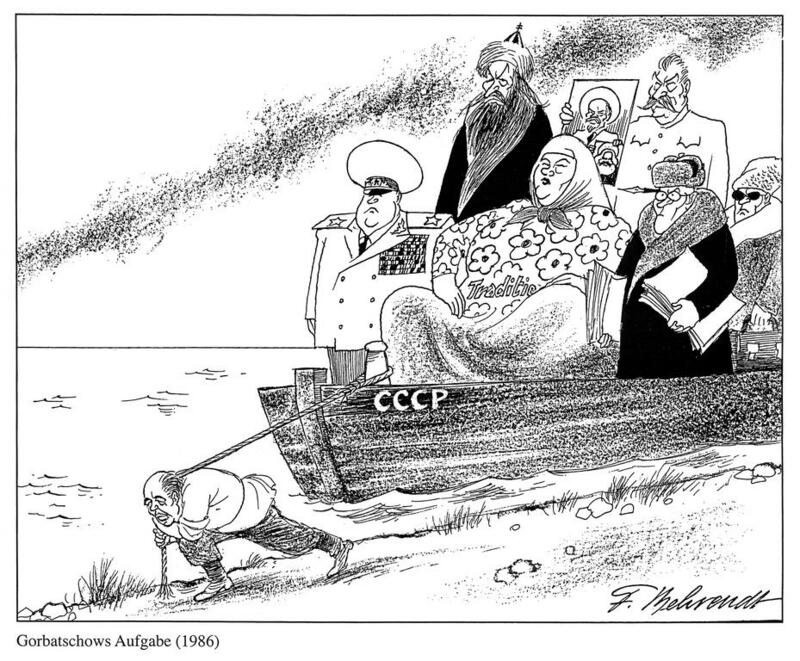 Ah, the Soviet Union… We miss it. Anyone who remembers the 20th century will be well aware that, back then, the Soviets were no joke. They were a big, influential power that effectively dominated a good chunk of Asia and Africa, as well as Eastern Europe. They had a big army, lots of very destructive atomic bombs and an utter lack of a sense of humor. So it might seem that the world is much better off without it. But after the fear-ridden years of the cold war, Communist Russia has not aged well. Casual observers looking back are already beginning to scratch their heads and ask themselves: did anyone take these clowns seriously? 1) Minor points in doctrine, impenetrable to most outsiders, could get you turned from a hero of the Soviet Union into a traitor to the Soviet Union before you could blink. Most people would look at communism and say “simple enough, no one owns anything, but everything belongs to everyone” possibly adding “let me know how that works out for you”, but not the Soviets. They regularly killed each other over invisible shades of gray. Killing Trotsky with a hammer in Mexico has to be counted among the more entertaining episodes of the 20th century. That combo of brutality and style has to be admired. 2) They were insistent that everyone was happier there in the west, and that the walls they had to build to keep their population in were actually there because the leaders knew better than the people and were doing them a favor. Also, shooting people attempting to flee was a favor: death was clearly a happier place than capitalism. Like Cuba today pretending to be a socialist paradise, that took chutzpah, and one cannot help but admire them. 3) They had established a monarchy but barefacedly told the world that the proletariat weren’t just politburo serfs. I can only imagine the kind of laughter that echoed in the halls of the Kremlin when they heard that some western activists wanted to align themselves with communism to gain “freedom” for the masses. Hats off to them for the sheer barefaced humor. The best practical jokes are always the ones where you wonder whether they might actually be serious. The truth is that no major government in the world today would dare do the things that the Soviets did in the name of “human rights” and of “equality”. Yes, there are some clown states like Venezuela or North Korea (although I think the North Koreans have long since given up any pretense of Marxism), but no one who gets taken seriously on a worldwide level. The Chinese seem to have found an excellent balance between communism and capitalism in a difficult situation, and Western countries generally seem to vote socialist for a few years before realizing that losing even more personal freedoms and having your economy destroyed isn’t worth the supposed benefits in increased equality that are eternally just around the corner. Today, you’ll only find that kind of lip service to obscure utopian principles in niche cultural areas. But back then, the USSR waved its missiles around and acted like what it was doing was perfectly normal. Since, by all accounts, the leaders of the country were reasonably stable hardened politicians, one must conclude that they were laughing at the rest of the world the whole time (well, except for Stalin. Anyone with a mustache like that has to have been batshlt insane). And if you didn’t like it? They’d boycott your Olympics*! After Tuesday’s post, you would be forgiven for thinking that we’ve given up all pretense of polymathy, discarded our manifesto and have decided to go on a film binge (something that we’re considering, at least for a couple more posts), but though today’s entry is part of the 1001 movies list, it ties many of Classically Educated‘s themes together so perfectly that we’re counting it as a separate entity. 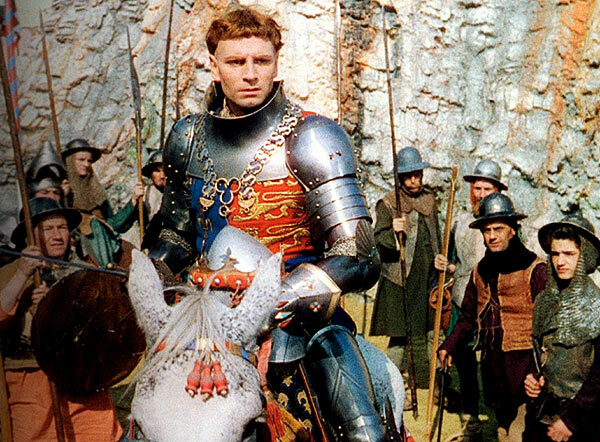 Henry V is a film from 1944 (there is also a version from 1989), that seems to tie together so many of our themes. In the first place, one must mention Shakespeare. 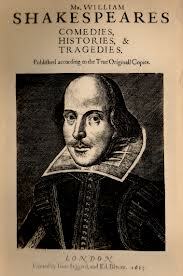 How can a blog calling itself Classically Educated go a full year without having a single post dedicated to the bard? After all, no less than four of his plays are included in The Harvard Classics famous Five-Foot Shelf! We’ve even done a piece on one of his contemporaries! The answer, of course, is mumble mumble mumble. And you choose to do a piece about a film as your first contact? Mumble, mumble, vague promises to write a highly opinionated analysis of his oeuvre at an unspecified future date, trashing Romeo and Juliet with particular savagery. Though this criticism is valid, Henry V is still a perfect subject for a post. Yes, it’s Shakespeare, and as such needs no real excuse to be transferred to celluloid, but one needs to remember where, exactly, we are within our chronological review of the 1001 movies list. 1944… there was a bit of bother going on in Europe and elsewhere at the time. Henry V, with some strategic alterations to the original text is a brilliant propaganda film (a genre we’ve discussed here before). Not only are Shakespeare’s Histories very probably his best work, but this one in particular reminds everyone that the British throne had a historically reasonable claim to the French crown, and shows a doughty British ruler walking into France and chastising a man he saw as an illegitimate ruler. Hmm, I wonder who they were trying to rile up? But the brilliance of the film lies in that instead of creating a blunt instrument of a propaganda film the British government elected to help fund a Laurence Olivier production the thing, and the results speak for themselves. This film mixes several ways of showing the action – from aerial views of 1600s London moving to the stark non-sets of the Globe Theater, to book of days type sets to full open scenery in the battle scenes, all in (possibly overly) vibrant technicolor. It’s not surprising that this film is considered to be the first artistically successful adaptation of Shakespeare to have done well at the box office (there’s a reason Hollywood tends to shy away from The Bard, and that reason is the failure of money to ensue when filming his plays in an artistically relevant fashion). Sadly, the first thing one needs to do when reviewing the film for a modern audience is remind them that textually, the film is an Elizabethan Play, which means that, unless one is already familiar with the text or deeply immersed in Elizabethan idiom, it does take some concentration to follow the dialogue. I personally believe that most modern viewers will be turned off by this alone. However, this particular play / film is worth the effort. You get more action an political intrigue in this than in most modern blockbusters – and you’re allowed to act snobbish about it afterwards (which I doubt anyone allowed you to do after watching the latest Transformers installment). There’s even a love story! And an attempt at comedy*. 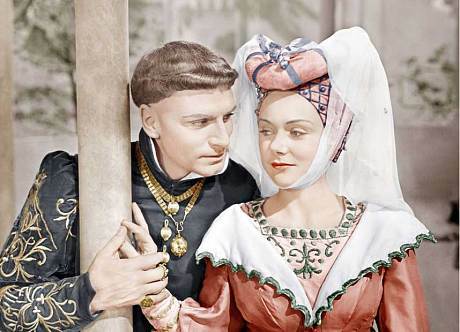 The love story, admittedly, was a bit hard to swallow, but then Henry V was a man with a big… kingdom, so perhaps he did have access to the best aphrodisiac. Anyway, I feel that, with the limitations on pacing imposed by the text, this is the definitive film version – and quite possibly still among the best Shakespeare adaptations to film despite a wealth of very good modern ones. I think Kenneth Branagh could have given the ’89 remake a miss – it wasn’t needed. The one disappointment has to be the famous “Once more into the breach” speech, whose delivery left me feeling that it should have been much less upbeat than it was. Perhaps it should have been more robust, perhaps grittier, but Olivier decided that “drunken toastmaster” was the vibe he preferred for that section. Also, casting the french nobility as inbred retards (except for Katherine) was probably meant as a message to Adolf, but didn’t do the film’s tension any favors. Even with these shortcomings and the language caveat, I’d strongly recommend this to anyone with a love for literature on screen. Final shout outs must go to two of the cast: Esmond Knight, who was wounded in WW2 and acted in the film despite being nearly blind and Renée Asherson, who played the aforementioned Princess Katherine, and who died last October – she gets a mention because she would have turned 100 years old in less than a week, so the post can be considered a birthday celebration on her hundredth. Anyway, find this one and watch it! *When discussing comedy and Shakespeare, it is best to be delicate, so here goes: in my opinion, Shakespeare was about as funny as a long session with a dentist’s drill. He might have recognized a good joke when he saw one, but I doubt it because everything approaching humor in his writing is either painful of based on sexual double-entendres aimed at the lowest intellects within an average street-theater crowd. There, I hope that was delicate enough. One of the interesting things about the 1001 movies list is that, unless you are up on your old cinema and theater, you don’t know what to expect with a lot of films. Gaslight (1944) was one of these. Before viewing it, I wasn’t familiar with either the play or the movie, so I expected it to be some kind of Victorian-era costume-drama love story. Of course it was nothing of the sort – and, if I’d thought about it a bit, I could probably have predicted it. You see, 1944 was smack in the middle of the film noir era, and its sensibilities ranged far and wide. Heck some of the films were even set outside of Los Angeles. The case of Gaslight, however, must be seen as an extreme example. Setting a noir-esque film in Victorian London was a bit of a stretch, even for the era. Given my choice, I’d have kept the genre in contemporary America – but that doesn’t mean that the film isn’t interesting. It has quite a few memorable aspects. The first is that by being set outside of the usual time and place of noir, it gets to play with social structures and even technology quite foreign to the hard-boiled private eyes that populate more typical fare. Even the film’s climax (won’t give spoilers) could not have happened during the mid twentieth century. So in that regard, it is quite clever. On the other hand, it also uses much of noir’s shorthand, especially the tortured human elements and unhealthy relationships that are so typical of the format. There’s even a hard-boiled detective (although he works for Scotland Yard as opposed to having a seedy office in a high-rise). 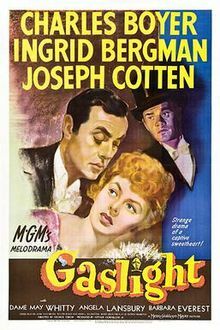 Though it’s not a bad movie, this one probably earned its place on the 1001 movies list because of the fact that it experimented in mixing genres in ways that most noir flicks didn’t in the 1940s. Yes, there were variations on the theme (making the hero an insurance salesman or a woman instead of a detective), but this one was probably the most extreme. 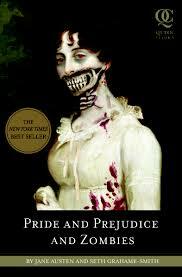 In a world a book called Pride and Prejudice and Zombies is a real thing (and soon to be a movie itself), an experiment of this sort probably wouldn’t attract a whole lot of attention – but that was not the case in 1944. So, glad to have seen it, but not really all that keen to recommend it to anyone. Watch it if the above has piqued your interest… or give it a miss. There are other, better films noir to spend your time on… and we’ll have a writeup of at least a few of them here soon!